Swiss goaltender Andrea Brandli only allowed two goals in the first and none in the second before Canada really turned up the heat in the third. They scored four goals on 17 shots in the final frame. Brandli didn’t get much help from her teammates as they only has six shots all game — four in the first, two in second, and zero in the third. Kendall Coyne-Schofield had two assists and a goal in Team USA’s wild comeback win. Finland was leading 2-1 off of goals from Holopainen and Nieminen after the second period, but in the third, Team USA scored five unanswered goals from five different players. Noora Räty made 39 saves, but Team USA’s third-period onslaught was just too much. 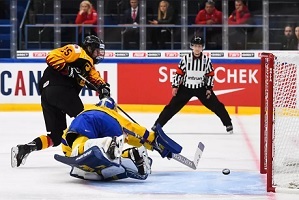 Germany opened the tournament by upsetting Sweden in a shootout, with Laura Kluge netting the sole and winning goal in the shootout. Both teams scored in the middle frame, though the Germans only recorded three total shots in the period. The whole game was busy for Germany’s goaltender Jennifer Harss as Sweden had 41 shots in the whole game. Japanese goaltender Nana Fujimoto pitched a shutout in their opening game stopping 25 shots against the newcomers, France.